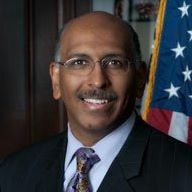 Join my fan page: http://www.facebook.com/pages/Michael-Steele/121513990069 Michael Steele is President and CEO of The Steele Group, a company he started in 1999. The Steele Group works with institutional and individual clients to design overall business development, investor, networking, and communications strategies. Presently, Mr. Steele is Political Analyst for MSNBC. Mr. Steele’s ability as a communicator and political analyst have long been showcased by his position as a contributor on the Fox News Channel and as a regular host for the Salem Radio Network’s nationally syndicated Morning in America Show. Additionally, Mr. Steele has been an entertaining and eloquent guest on cable political talk shows such as HBO’s Real Time with Bill Maher and Comedy Central’s The Colbert Report. Steele is also co-founder of Purple Nation Solutions a D.C.-based strategic communications and public affairs firm. He and his partner Lanny J. Davis have created a bipartisan, global, one-stop shop where law, media, and politics intersect to provide real solutions employing legal means, political lobbying, and media management. Mr. Steele’s experiences as a successful elected conservative African-American Republican and his engaging speaking style have launched him into national prominence. Mr. Steele is represented by Keppler Speaker’s Bureau and regularly shares his personal story and political philosophy with a wide variety of audiences. Most recently, Michael S. Steele served as Chairman of the Republican National Committee on January 30, 2009 - January 14, 2011. Steele left the RNC post earlier this year after setting a new direction for the Republican Party that led to record-setting fundraising totals and winning more seats at the federal, state, and local level since 1928. This success was achieved by his commitment to actively engage Americans in their local communities and empowering state and local Republican organizations to do the same. A self-described “Lincoln Republican,” Mr. Steele earned a place in history in 2003 when he was elected Lieutenant Governor of Maryland, becoming the first African-American elected to statewide office in the state. An expert on political strategy and election reform, he served as Chairman of GOPAC, and also held posts on the National Federal Election Reform Commission and the NAACP Blue Ribbon Commission on Election Reform. Mr. Steele writes a regular column for The Root and BET and his writings on law, business and politics have appeared in The Wall Street Journal, The Washington Times, Politico.com, Townhall.com, and The Journal of International Security Affairs, among others. Born in 1958 at Andrews Air Force Base in Prince George’s County, Maryland, Mr. Steele was raised in Washington, DC. He spent three years as a seminarian in the Order of St. Augustine in preparation for the priesthood, but, ultimately, chose a career in law instead. He earned his law degree from Georgetown University Law Center in 1991. Mr. Steele serves on the Administrative Board of the Maryland Catholic Conference and is a member of St. Mary’s Catholic Church in Landover Hills, MD, where he attends mass regularly with his wife Andrea and their two sons. Discover Michael Steele's address history, phone, age & more.